Today's Deal of the Day at RPGNow is +Joe Wetzel / Inkwell Designs 5e Creature Decks. Normally $5.95 in PDF, the decks are on sale for $2.97 in PDF for 24 hrs. I do say decks, because although just one deck is technically the Deal of the Day Joe has discounted the rest of the 5e Creature Decks. Oh, and he's also discounted the Print & PDF option too. Joe's creature decks are some of the best RPG resources that fit in a pocket that I've come across. The art is top notch and cards are just plain useful. I have them in both OSR and 5e versions myself. Today (July 9th 11am US Eastern to July 10th 11am) this is the deal of the day! But we've also reduced the price of the other 6 5e Creature Decks we've made. (7 Total.) 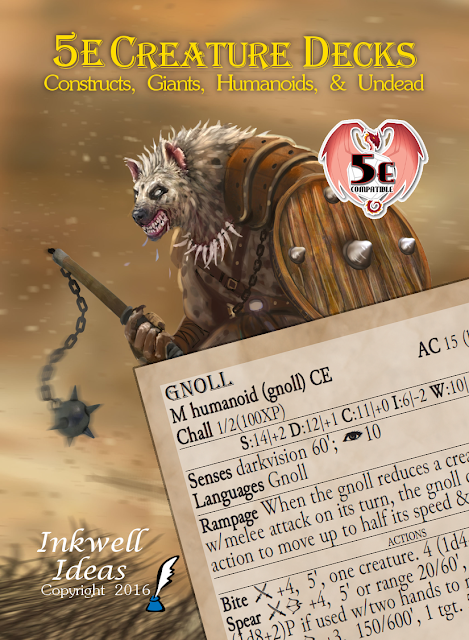 4 Decks have all the creatures in the official 5th edition System Refence Document of the world's best known role-playing game. The other three decks have more creatures converted from other editions. The cards are a deck of 58 cards (56 creature cards, one cover/checklist card and one license card). Note that one creature (the vampire) is split between two cards because it had a lot of game information. I can attest that Inkwell Ideas seems to use art that is generally REALLY good. I have the printed version of the blank/lined-back Humanoid & Monstrous Humanoids deck, and it's quite enjoyable just to sit and look through the cards. Good stuff.